This stylish Men's Fisherman's Sweater will have your man looking looking dapper this holiday season. Crew Sweaters looks great when paired with a collared shirt underneath. Green wools were intertwined giving this a deep masculine color which can be worn with smart pants or jeans. In other words it matches with so many colors you don't have to over think what to wear! Every man with Irish Heritage should have this wardrobe staple in their closest as is such a versatile sweater. This is for those who want to know the meaning of the sweater. 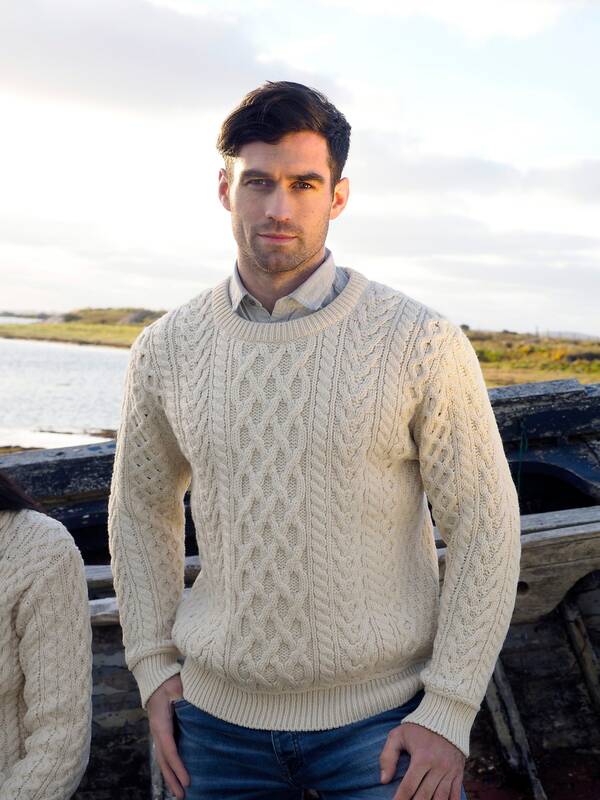 Aran Patterns in Irish Sweaters carry meaning. The Diamond stitch ( the symbol of wealth in Irish patterns, yes we are a superstitious nation) is used along the sleeves and the outer body of the sweater while the basket stitch ( this was to wish fisherman a good days catch at sea) runs along the center and sides of this classic Irish sweater, the use of the cable stitch ( symbol of the fisherman ropes) compliments the basket stitch beautifully.